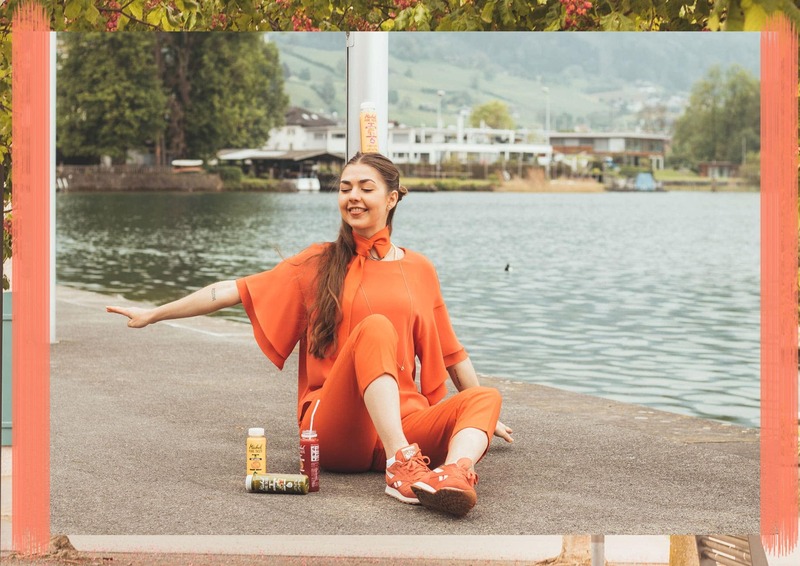 Enjoying a fruit juice in the morning, on the go or as a little treat during the day. Even if it’s raining nonstop, the day is fully packed with appointments or we cannot understand the current happenings in our world, a vitamin booster makes everything a bit better. Since refreshments like these show up in a good mood right away, the resulting feels also influence our outfits. 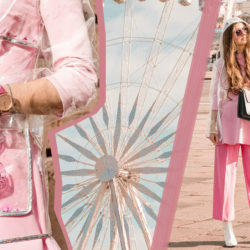 So let’s have a look at how a novelty in a bottle will impact our style. Just in time for the beginning of summer, Michel launched the new “Pure Taste” juices in four different flavors. Whether you are in the mood for a mix of avocado, spinach, mango and bananas or you prefer a classic orange juice, there’s a whole fruity selection to choose from. Either way, the colorful, cold pressed juices guarantee a refreshed state of mind right away. Eventually, those good feelings from the inside also show up in the outfits. Apparently, prints are always up for some happy vibes. At the same time, one single color can have a similar effect. This is also why labels like Acne Studios or Tibi chose monochrome looks in various color variations for their spring/summer collections this year. So instead of adding in only one pop of color with a red clutch bag, why not dare to go for the full game in a total red look? Speaking of red, the color is actually the perfect choice for an all-over look. Just think of the several meanings and associations that go with it. It’s the color of revolutions and culture. It’s the color of royalty and Buddhists, of red roses and red lipstick. It’s the color of life, of stop signs and of excitement. It’s the color of high heels (thanks Mr. Christian Louboutin) and of Ferraris. Whether you look at Givenchy or Valentino, red has always belonged to fashion and it has always stood for feminine modernity such as black or white. 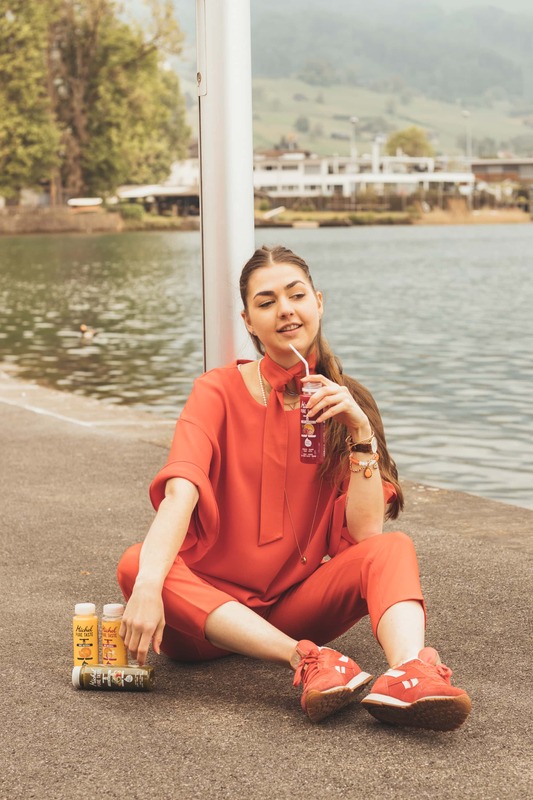 Already fashion designer Bill Blass used to say: “When in doubt, wear red.” He actually had a good reason for this quote because of the clear, confident attitude that comes with every red outfit. By the way, you can even improve the chances of winning a sports match when wearing red! Since those red hues play such an important part in our lives and even in history, they naturally spread an impression of security. This feels quite refreshing in today’s hectic, sad and often absurd world. 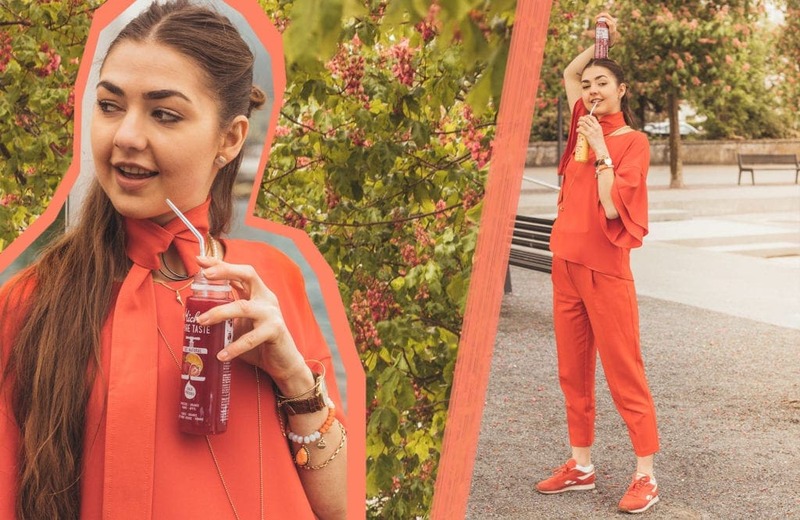 So ultimately, a red outfit can spread the same good, powerful and pure vibes like a cool cold pressed fruit juice does. So let’s give it a smile and spread some joyful feels. Cheers! 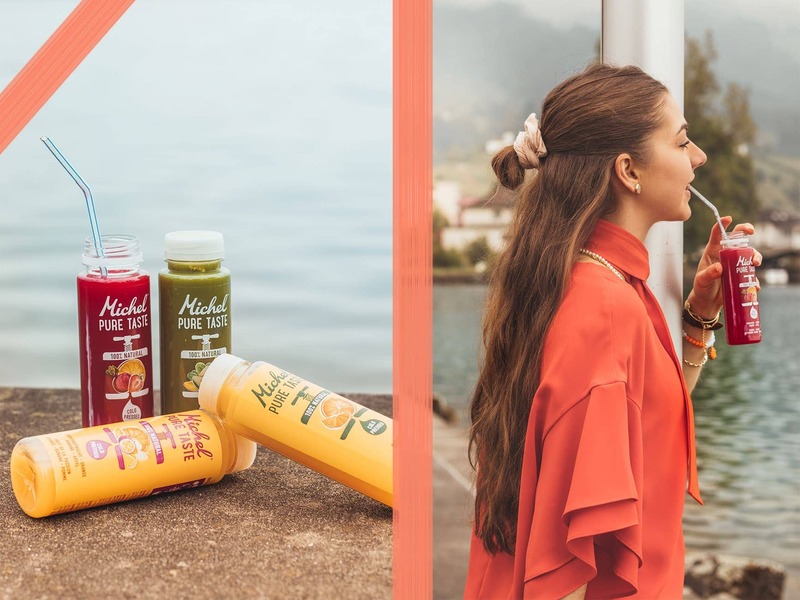 For all Swiss readers, get Michel’s “Pure Taste” juices now in the stores of Coop Pronto, Coop@home, LeShop, Manor, backeries and in the classic gastronomy. This post is based on collaboration with Michel. 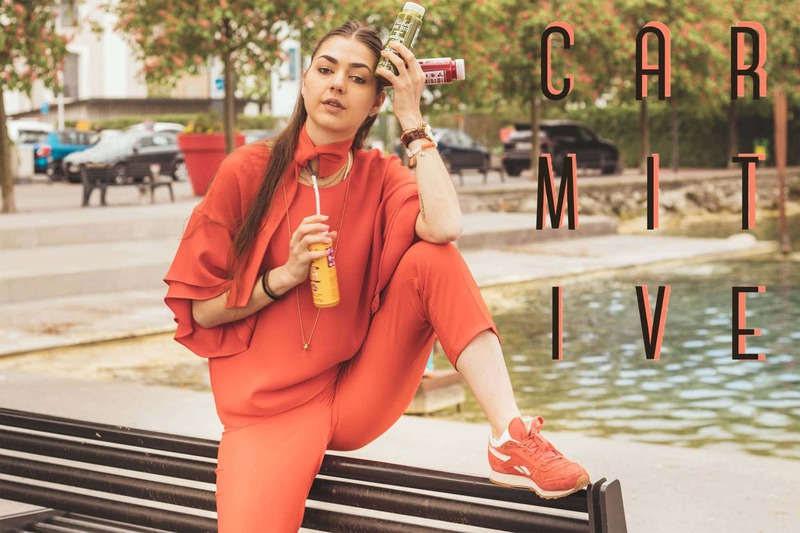 Posted in Fashion & Outfits, Healthy & Stuff and tagged Fashion, Inspiration, Juice, Lifestyle, Monochrome, Red, Smoothie, Spring Summer 2018, SS18, Style, Things to love, Trend. Bookmark the permalink. This outfit is fabulous! 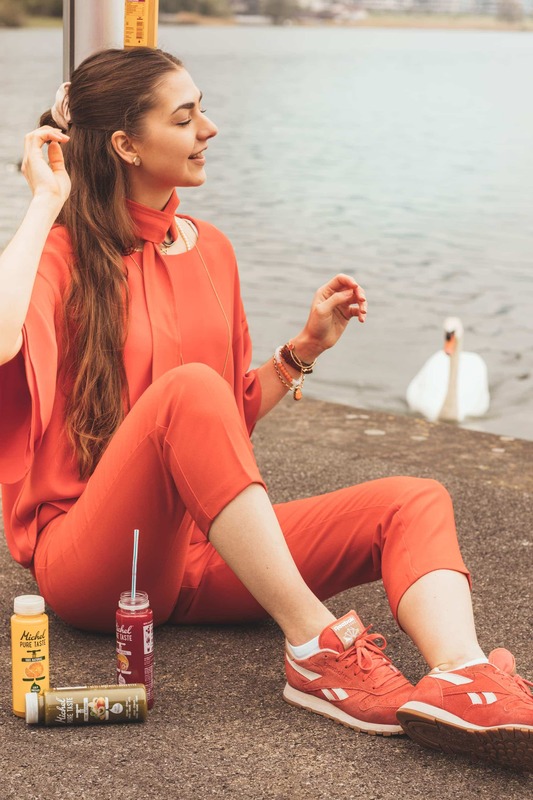 I love the salmon colour of both the top and pants, and how in earth did you find a pair of trainers to match so perfectly! It’s like the perfect stylish street-style look. And the colour of the juice matches perfectly too. I can see you wearing this outfit a lot this summer. I’m a huge juice lover. They’re such an easy and yummy way to get tons of vitamins into your diet because they taste so good but are packed with tons of nutrients. I always keep a couple in my fridge if I’m in a rush and need to grab something and go. Definitely going to look into these. Have a wonderful week dear! Oh thank you so so much for your kind words Isabella! This means very much to me and I am glad you like the post – you should try out those juices when you can, I am sure you would love them! Thanks for sharing! I love this outfit on you the colour is so beautiful! I need to try these juices! Thanks a lot – haha oh yes exactly! That shade of orange is absolutely gorgeous on you, Carmen! It’s such a vibrant, playful color, perfect for this time of year. Have a wonderful week! Oh they are! Thanks so much Laura! You look so amazing in orange! Thankss so so much dear! Really love the vibe of this post! oh das freut mich sehr meine Liebe! Da hast du auch absolut recht 🙂 Ich wünsche dir auch eine ganz schöne Woche! These juices sound great, and I love the red color. Oh thankss so so much sweetie! Oh thanks very very much Olivia! Oh yess, you’ll love them for sure dear! So fun and the color red suits you! Loving this color on you, lady! So bright and happy! Oh thanks so much Ashley! Oh thanks a lot Margot! Thank you very much Layla! I love fresh juice! So good! Oh yess, it’s always a good idea! Oh my you reminded me I forgot to take my vitamins today.Ugh. Love this head to toe peachy orange look. So fun and fresh looking. A wonderful shade for spring. Girl, you look amazing! 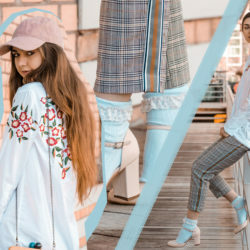 Love this look on you! Perfection as always! oh thank you very much Len! Oh das freut mich meine Liebe! Du musst die Säfte bei Gelegenheit wirklich testen, sie sind super lecker! Ok Wow! Ich war gerade zum ersten Mal auf deinem Blog und bin wirklich hin und weg von dem Design, deinen Bildern, deiner Person. 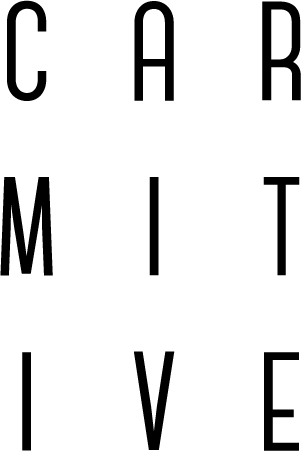 Super kreativ – ich liebe meinen Blog zwar sehr aber ich wünschte meiner würde so vor Energie sprühen. Die Smoothies kenne ich noch nicht, werde sie aber bei Gelegenheit mal probieren. Aaw Miri vielen viielen Dank! Das freut mich wirklich unglaublich, hab einen wunderschönen Tag!